Red Hat Network is an Internet solution for managing one or more Red Hat Enterprise Linux systems. 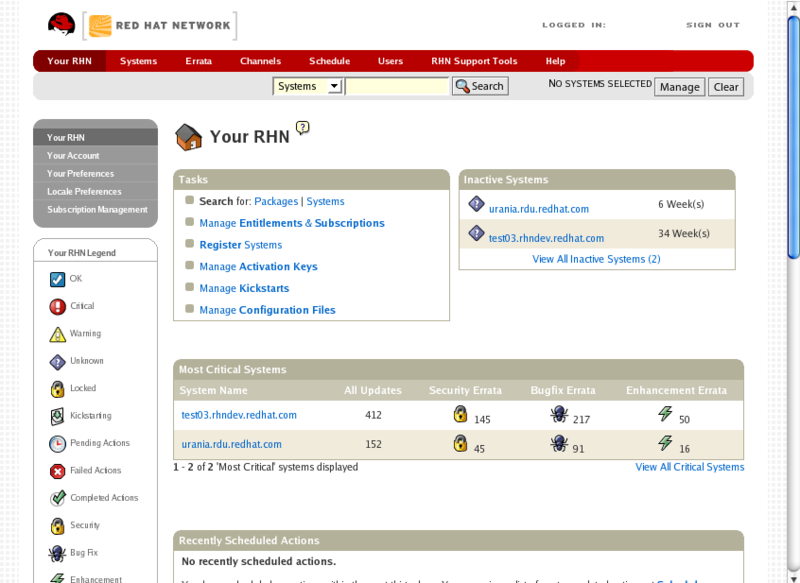 All Security Alerts, Bug Fix Alerts, and Enhancement Alerts (collectively known as Errata Alerts) can be downloaded directly from Red Hat using the Package Updater standalone application or through the RHN website available at https://rhn.redhat.com/. Red Hat Network saves you time because you receive email when updated packages are released. You do not have to search the Web for updated packages or security alerts. 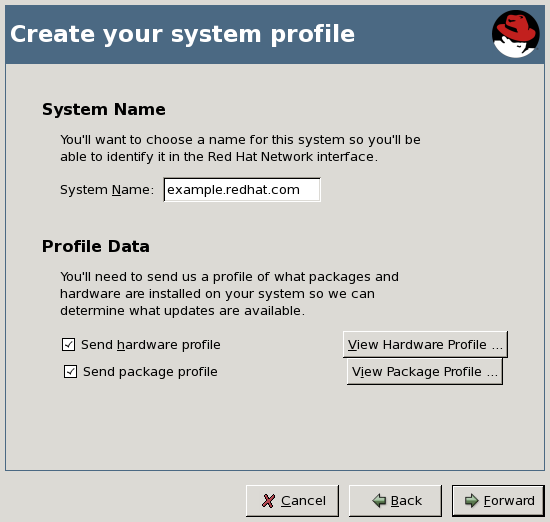 By default, Red Hat Network installs the packages as well. You do not have to learn how to use RPM or worry about resolving software package dependencies; RHN does it all. 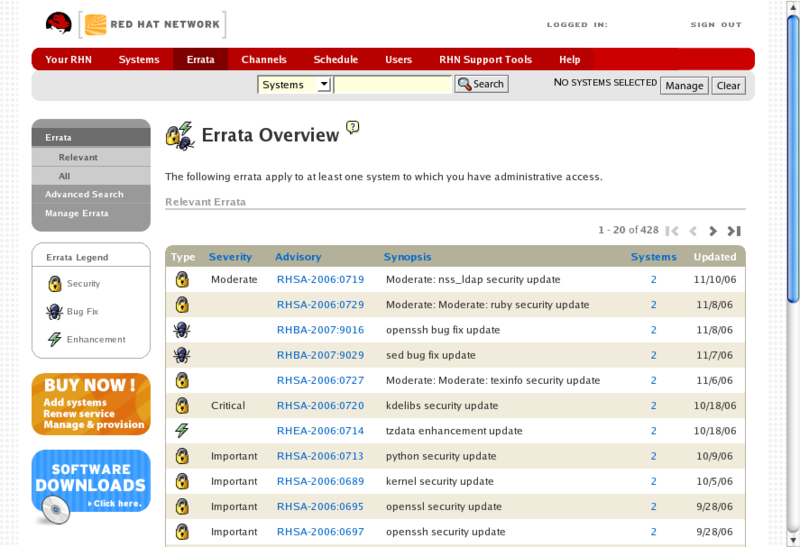 After activating your product, register it with Red Hat Network to receive Errata Updates. The registration process gathers information about the system that is required to notify you of updates. For example, a list of packages installed on the system is compiled so you are only notified about updates that are relevant to your system. The first time the system is booted, the Software Update Setup Assistant prompts you to register. If you did not register then, select Applications (the main menu on the panel) => System Tools => Package Updater on your desktop to start the registration process. Alternately, execute the command yum update from a shell prompt. Click on the package icon when it appears in the panel to launch the Package Updater. Red Hat Enterprise Linux includes a convenient panel icon that displays visible alerts when there is an update for your Red Hat Enterprise Linux system. This panel icon is not present if no updates are available.